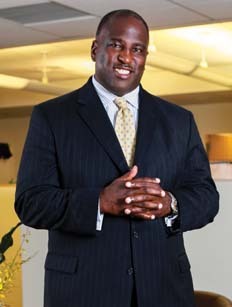 As campaign manager, Dove and his philanthropic team of six dole out grants ranging from $50,000 to $1 million to organizations whose initiatives include programs centered on educational equity, strengthening family structure, increasing employment opportunities, and improving the image of the black male. To date, the campaign has invested more than $30 million in organizations improving life outcomes for black men and boys. Education: Dove earned a Bachelor of Art in English from Wesleyan University in 1984 and is a 1989 graduate of Columbia University Business School’s Institute for Not-for-Profit Management. In 1994, he was a Charles H. Revson Fellow at Columbia University. At Wesleyan, Dove developed a passion for writing, serving in editorial roles at two publications on campus. Dove was certain his degree would lead him to a career in sports reporting, but that changed once challenged with trying to support himself in New York City. He landed a job in textile sales, but Dove longed for something more meaningful. He wanted to make a difference in the African American community. Dove, a father of four, applied for the coveted job that had attracted a huge pool of candidates. It was a three-month vetting process that included five interviews. The project was launched in 2008 by George Soros’s Open Society Foundations, and is the largest philanthropic initiative to address the economic, political, social, and educational exclusion of black men and boys from mainstream America. By the time Dove landed the job, it was as if he had been grooming for the position his entire life. With leadership positions in the fields of education, community building, and youth development, Dove had all the right credentials. “Everything I have done in my career has helped in this golden opportunity,â€ he says. “I’ve worked in the [youth development, educational, and community development] fields for decades and I’ve been on both sides of the table.â€ Dove’s previous positions include vice president for MENTOR/National Mentoring Partnership; executive director of The DOME Project, a youth development organization; and Creative Communities director for the National Guild of Community Schools of the Arts. Dove was also program director at the Harlem Children’s Zone for a decade, where he was the founding editor-in-chief of Harlem Overheard–an award-winning newspaper produced by youth–and helped launch one of New York City’s first Beacon schools.